Bealtaine, Enda Kenny explained, is that time of year when Irish people look ahead to the start of something new. A celebration of the return of life. A period for renewal and reawakening. The transition between spring and summer. It was a compelling analogy chosen for the Taoiseach's keynote speech in Montreal, given that he himself is the centrepiece of the change soon expected in the political landscape at home. And as Mr Kenny stepped on to Canadian soil this week, he knew too that the handing over of the reins of the Fine Gael leadership is a process he can no longer delay. Even before Mr Kenny departed for his last official overseas State visit, the two main rivals for his job were stepping up their bids. Leo Varadkar and Simon Coveney are now on the cusp of full campaign mode as they both prepare for nationwide tours. Perhaps Mr Kenny was already privy to the fact that he was travelling across the Atlantic, to the 'Land of Plenty', as a lame-duck Taoiseach. It would explain his response to media questions about his plans to step down. On Thursday, flanked by the young Canadian Prime Minister Justin Trudeau, Mr Kenny twice said he "couldn't believe" he was being asked about the leadership at a business event so far from home. Various reports across all media present for the visit noted the tone of Mr Kenny's reaction. It was one of annoyance, even anger. The Taoiseach's officials quickly went into spin mode, telling journalists that Mr Kenny was temperate and at no point raised his voice. Yesterday, in Toronto, Mr Kenny said his focus on the trip was on trade and investment and that his plans to step down was simply not up for discussion. "I don't intend to discuss the question of leadership or the future of the Fine Gael party when I'm on a trade mission or investment mission to Canada." He rejected suggestions that he had taken "umbrage" with being quizzed over the leadership the previous day. It was put to the Taoiseach that perhaps he was having second thoughts? Had he changed his mind about stepping down entirely? "No, I've been very clear with my parliamentary party about this." Back home, Mr Coveney said he didn't believe "we're going to have to wait too long" for an announcement. Asked about the dramatic prospect of a heave, Mr Coveney responded: "I think that's nonsense talk, quite frankly." Officials who travelled with the Taoiseach on his State visit to Canada were keen to emphasise the warm relationship struck with Mr Trudeau. Of course, the age gap of 20 years was not the only glaring contrast between the two leaders as they met in downtown Montreal. 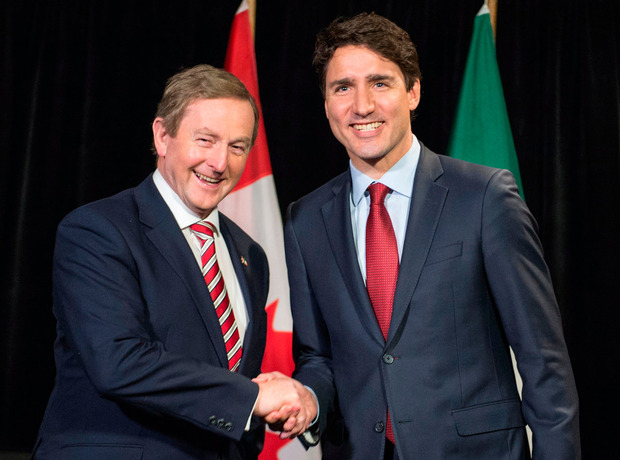 Mr Trudeau oozed dynamism and swagger, two traits rarely associated with the Mayo TD. Only one of the politicians present could pull off wearing odd, flamboyant 'Star Wars' socks. The optics of the joint press conference painted a clear picture: here was one political story in its final chapter; the other having just begun. Aside from personal style and their taste in socks, both Mr Kenny and Mr Trudeau were keen to emphasise the shared values between themselves, their governments and their people. Mr Trudeau spoke of the desire of both the Irish and Canadian governments to look after the "middle classes". While Mr Kenny - in a speech that was warmly received - warned of the dangers posed if the centre ground fails to hold. "And it is the centre that the Irish Nobel laureate WB Yeats once said cannot hold, now must hold, and hold with alacrity," Mr Kenny said during a Chamber of Commerce dinner in Montreal. "Across democracies, our best are being pushed to the hard left by anger, to the hard right by fear," he added. While emigration featured heavily as a theme in all of Mr Kenny's speeches during his visit to Canada, it was his treatment of another issue that stood out. Mr Kenny told an audience in Toronto yesterday that the prospect of the whole of Ireland holding membership of the European Union is now on the cards as a result of the deal agreed in Brussels. But when asked whether a United Ireland will happen in his lifetime, the 66-year-old paused before giving a wry smile. "I could say I don't know how long anyone is going to live but the opportunity politically is now in situ and was in situ from the Good Friday Agreement."